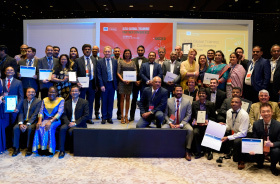 New Delhi, India, 2019-Apr-15 — /Travel PR News/ — The International Air Transport Association (IATA) announced its 2019 Premier Circle winners as well as its regional top performing training partners as part of its prestigious recognition program. More than 450 IATA global training partners are evaluated on select criteria, such as the quality of training delivered determined by the examination pass rate, the number of students trained, and many other factors. Also measured is the growth in enrollments vis-à-vis the previous year. The excellence of these training partners contributes significantly to the development of the next generation of aviation professionals. This entry was posted in Airlines, Airports, Business, People, Travel, Travel Awards, Travel Management, Travel Services, Travelers and tagged award, IATA, partners, Premier Circle, Stephanie Siouffi, training, winners. Bookmark the permalink.